Lucas Coils - I Say Ding Dong Shop - Buy Stickers, Decals & Unique Automobilia. 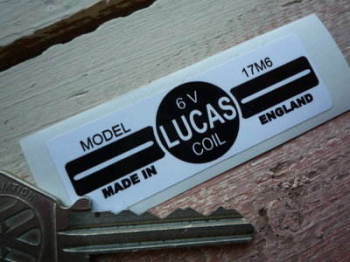 Lucas Ballasted Coil Sticker. 12V. 1. 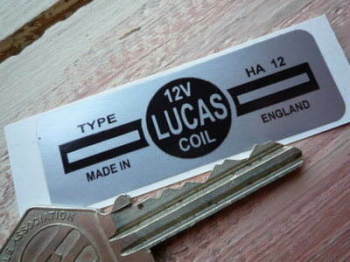 Lucas Coil Sticker. Fluid Cooled Clear. HA12 12V. D.
Lucas Coil Sticker. Fluid Cooled Gold. HA12 12V. 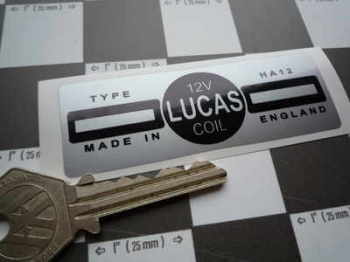 A.
Lucas Coil Sticker. Fluid Cooled Gold. HA12 12V. 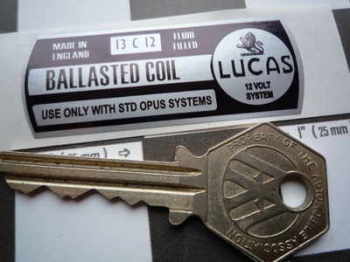 O.
Lucas Coil Sticker. Fluid Cooled Silver. HA12 12V. 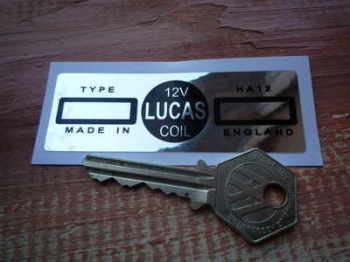 P.
Lucas Coil Sticker. Fluid Cooled Silver. Small. HA12 12V. 17. 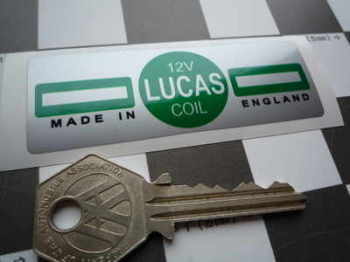 Lucas Coil Sticker. Old Style Green. LA12 12V. 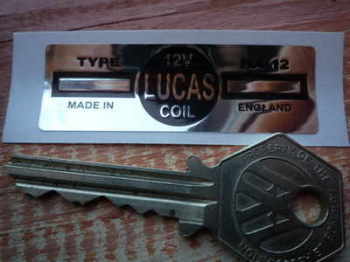 J.
Lucas Coil Sticker. Red & White Break. 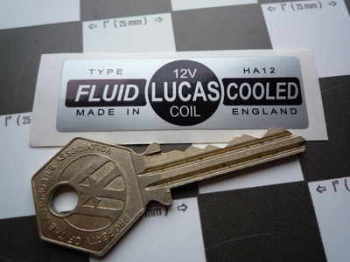 V.
Lucas Fluid Cooled Coil Sticker. Silver. SA12 12V. 3. Lucas Gold Coil Foil Sticker. 12V. 5. 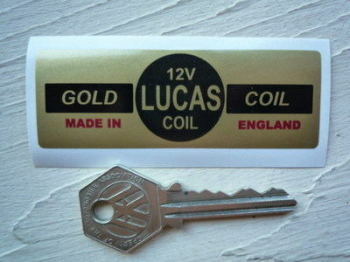 Lucas Gold Coil Sticker. 12V. W.
Lucas Ignition Coil Sticker. Black & Foil. HA12 12V. 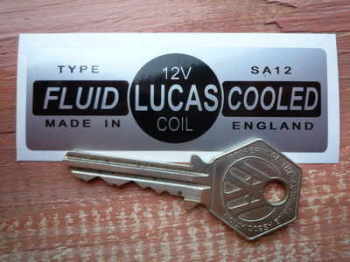 F.
Lucas Ignition Coil Sticker. Black & Foil. HA12 12V. Z.
Lucas Ignition Coil Sticker. Black & Foil. LA12 12V. C.
Lucas Ignition Coil Sticker. Black & Foil. LA12 12V. K.
Lucas Ignition Coil Sticker. Foil. Small. 12V HA12. 4. 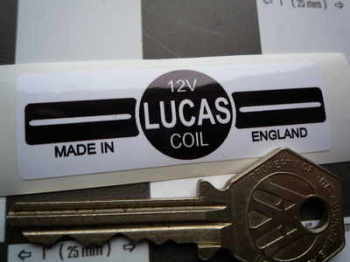 Lucas Ignition Coil Sticker. Green & Foil. 12V. 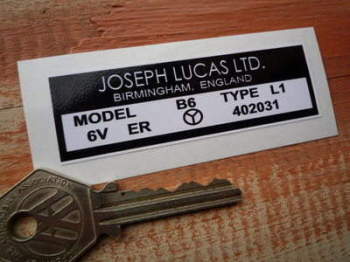 G.
Lucas Ignition Coil Sticker. Green & Foil. 6V. MA6. 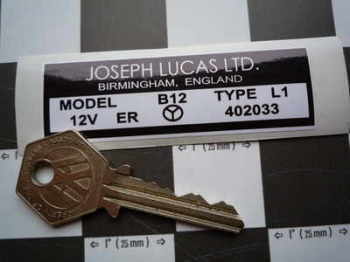 B.
Lucas Ignition Coil Sticker. Green Break. T.
Lucas Ignition Coil Sticker. Green. 12V. 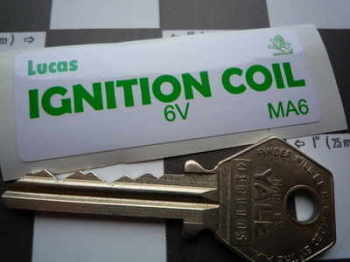 M.
Lucas Ignition Coil Sticker. Green. 12V. S.
Lucas Ignition Coil Sticker. Green. Small. 6V MA6. 12. 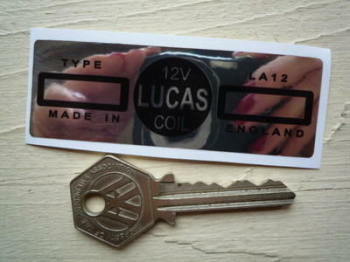 Lucas Ignition Coil Sticker. Silver. HA12 12V. 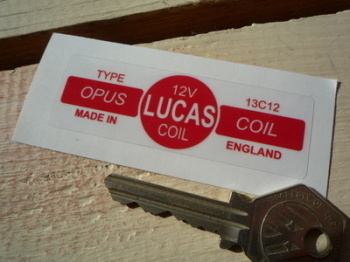 E.
Lucas Ignition Coil Sticker. Silver. Small. 12V. 23. 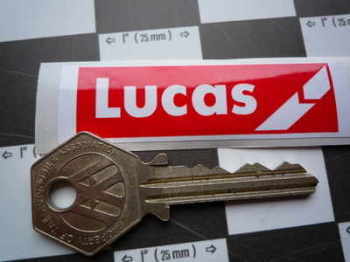 Lucas Ignition Coil Sticker. Silver. Small. 6V Model 17M6. 18. 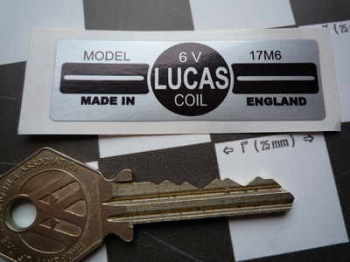 Lucas Ignition Coil Sticker. White. Small. 12V. 13. 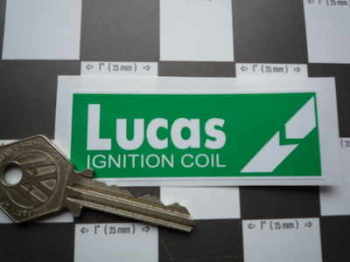 Lucas Ignition Coil Sticker. White. Small. 6V Model 17M6. 22. Lucas Joseph Lucas Coil Sticker. B12 12V. Black & Gold. 6. Lucas Joseph Lucas Coil Sticker. B12 12V. Black & White. 14. Lucas Joseph Lucas Coil Sticker. B6 6V. X.
Lucas Opus Coil Sticker. Red & Clear . 13C12 12V. 2. 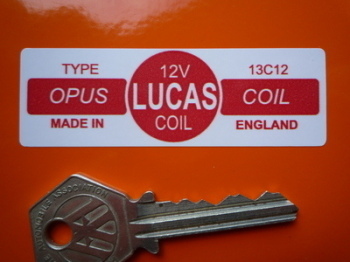 Lucas Opus Coil Sticker. Red & White . 13C12 12V. 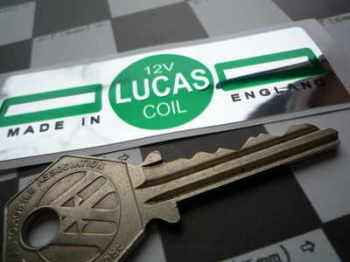 Y.
Lucas Power Coil Sticker. HP12 12V. 16. 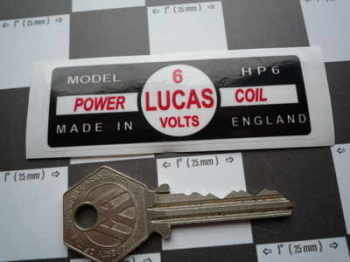 Lucas Power Coil Sticker. HP6 6V. 20. 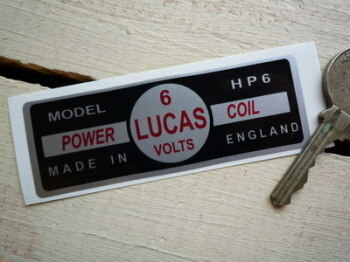 Lucas Power Coil Sticker. HP6 6V. 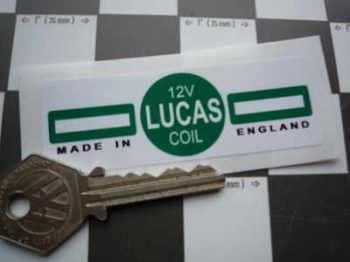 Q.
Lucas Power Plus Coil Sticker. HP12 12V. 21.